Successfully Added Cap Hidden Recorder - Kit with Camera + DVR + SD Card to your Shopping Cart. 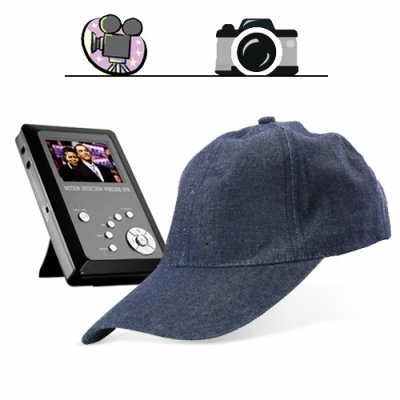 Baseball cap style with wireless DVR and memory card for making hidden recordings. This new edition of our popular "Cap Hidden Recorder" comes with everything you need to get started doing covert in-person video recording; the wireless camera hidden inside the blue cap, the pocket DVR, and even the SD Card! That's right, you get the wireless camera and wireless video receiver / recorder already put together in a ready-to-use kit so you can instantly go out in the field and do some instant in person video recording without anyone knowing what you are up to! So how does it work? When you put on this normal looking hat and turn on the camera, it lets you record exactly what you are looking at. This wireless camera sends a wireless signal to the pocket DVR which then records the video onto an SD card, meaning there are no wires to give away your secret! Whether you need a investigative hidden surveillance camera or just something to have some fun with, you cannot go wrong with the CVBLM-CAPC-PAL. Buy yours today at a great wholesale factory direct price from Chinavasion.